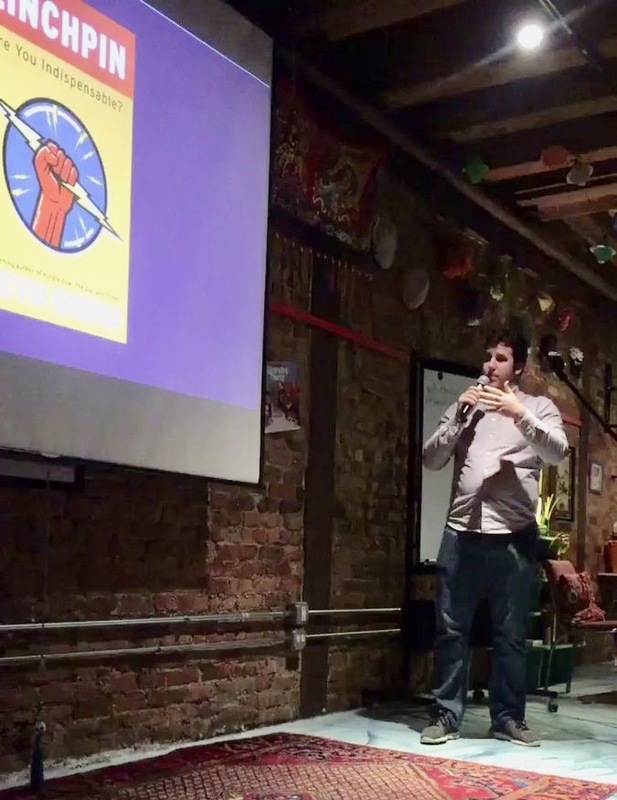 I’m no stranger to public speaking, but a couple months ago when I came across the concept of Ignite talks, I was in for an interesting new challenge. If you haven’t heard of Ignite Talks before, it’s a format of public speaking where your entire talk is comprised of 20 slides, each 15 seconds in duration, which auto-advance underneath your talk for a total length of 5 minutes. I’m used to giving talks more in the 45-60 minute range (Looking to host a workshop at your company? Let’s talk. ), so building a talk that told a complete story in 5 minutes was going to be something different for me. Couple that with the fact that I didn’t have control over advancing my slides, and it seemed I was in for more of a performance than the workshop-like talks I was used to. In the end, I took my inspiration from a passage in Seth Godin’s Linchpin and spoke about times when opportunities in my career made me fearful and unsure. What separates the linchpin from an ordinary person is the answer to this question. Most of us feel the fear and react to it. We stop doing what is making us afraid. Then the fear goes away. The linchpin feels the fear, acknowledges it, then proceeds. I can’t tell you how to do this; the answer is different for everyone. What I can tell you is that in today’s economy, doing it is a prerequisite for success. To me, that’s super powerful. Everyone encounters fear at some point in their career and how you deal with can set you apart or it can hold you back. It turns out that this Ignite talk became the perfect example of such an opportunity. I can’t remember the last time I was nervous to give a talk in front of an audience. But as I stepped up and took the microphone off the stand, my hands were shaking a bit. But like the other times I’ve embraced fear in my career, everything turned out OK. My slides got ahead of me a little bit, but I was able to catch up. 5 minutes flies by when you’ve got the lights on you and the mic in your hand. I shared great stories with audience members after the event and had a great time hearing the other speakers share their experiences. Taking on this new format was a bit of a risk for me, but it was absolutely worth it. If you think you might enjoy doing the same, head over to ignitechi.org and click on that big “I Want to Speak” button. Feel the Fear. Acknowledge it. Proceed. I hope to be hearing from you at the next Ignite Chicago!